Njut av våt och vild äventyr på Niagara-floden på denna Niagara Falls-öppna jet-båttur. Hoppa ombord på din kraftfulla snabbbåt och rem i för en spännande tur. Zooma över de rullande vågorna när din kapten delar underbar kommentar och känner sprayen i ditt hår när du njuter av den ultimata Niagara Falls-upplevelsen. The ride and crew were great!!! Definitely a fun.... wet lol... adventure... would do it again!!! Great job guys!! An awesome time with my family. It was cold but well worth it. You will get wet so take some clothes to change into. Enjoy the ride! I cannot even describe what an amazing experience this was. If you’re a thrill seeker, this is something you have to do! They went through all the safety precautions before hand and were all extremely nice and welcoming. Would highly recommend this tour and would gladly do it again if I return to Niagara Falls. First time with this ride and was totally worth it. The whole crew was good. They even have water shoes that everyone can borrow. Thank you. A fun time !! Wished it never end. Short 20 min drive from Canadian side of the falls to Niagara on the lake village. Which is full of cute old world charm cafe and shops. Jet boat ride was fantastic tour leader Asia was nice and fun. Get there early Will do it again !!! And again !!! This exciting, astonishingly fun ride did not disappoint. You get hit with a wall of water...several times...and you laugh bigger and louder than you thought possible. Only caveat is to those who wear glasses. Bring your glasses case. You can store them in a safe bag right in front of you. With the case, you'll be sure they don't get scratched. We were completely drenched as promised. Going on a sunny, warm day is preferred. Man! What a blast! This was truly the highlight of our trip to Niagara, Ontario, Canada! 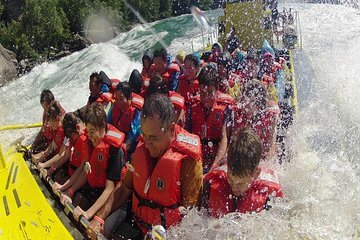 Amazingly thrilling, fun way to experience the Niagara River, and see the whirlpool and power station. You will get soaked, but it was nice on the warm October day. Will share and highly recommend experience with other Hawaii friends and family. We went to Niagara Falls the weekend of 8/4/2016 and did this boat tour. It was the highlight of our trip and our teenage boys loved it. My husband and I had a great time. It was a lot of fun and we got plenty wet! I would recommend it for visitors to Niagara Falls in Canada.